Midas is North America’s leader in brake services and we are, and have been, your one stop exhaust experts but did you know we do as many A/C system repairs as any facility out there? Our multi–point diagnostic inspection was developed by Midas technicians after years of training and experience. We start by printing a detailed summary of your vehicle’s specific A/C components. We then check the usual culprits in most poorly performing A/C systems; the Cabin Air Filter and the A/C Refrigerant. We visually inspect the Cabin Air Filter to ensure it isn’t dirty and restricting air flow to the passenger cabin. The A/C refrigerant is tested using chemically coated strips that measure the amount of additives that are in your vehicle’s refrigerant, if the additives are low an A/C Refrigerant evacuation and recharge will usually solve your heating and cooling woes. Next we visually inspect the air conditioning system, checking for any damaged or corroded hoses. If none are found it’s time to bring out the heavy artillery. 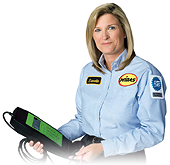 Using the industries leading technology in refrigerant detection, our technicians connect your vehicle’s A/C system to a vacuum creating a pressurized environment where any leaks can be easily detected, assessed and repaired. We recommend having our multi–point diagnostic inspection performed at least once a year. This will help prevent an A/C meltdown from occurring and save you a lot of money in the end. A cheap hose that is corroding or breaking, or contaminated refrigerant may lead to much more expensive repairs.